Peppered moths come in two kinds - peppered (obviously) and plain black. When first discovered, only 2% of the moths were black, but within fifty years that proportion shot up to 95% and it took a very clever lepidopterist to find out why. His work, much criticised by creationists, was confirmed by the late Michael Majerus in a seven year study which confirmed his conclusions beyond reasonable doubt. And yet, in the last half century the moths are back to 2% black. 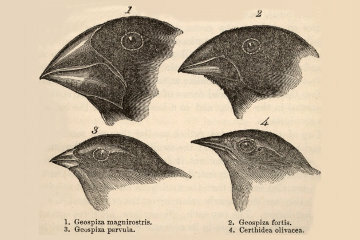 Galapagos finches are also known as "Darwin's Finches" because of the important part they played in Darwin's formulation of his theory of evolution, yet he took no notes and couldn't have understood the little critters even if he had! What is worse, recent studies by scientists such as Andrew Hendry and Peter and Rosemary Grant have shown evolution complete from beginning to end in two weeks - and evolution running in reverse! Darwin must be turning in his grave!